At the invitation of Council, residents and business owners have indicated their top 2013 budget priorities through both written submissions and through direct input at the Open House. Your top five priorities are road improvements, infrastructure replacement, downtown development and revitalization, off-leash dog park, and trail & path development. Other items on the public “wish list” include an outdoor skating rink, water spray park, sidewalks, street lighting, north approach to the Village, Parks development, outdoor pool/basketball/tennis court, and further Rec Complex redevelopment. Infrastructure: “Roads and underground infrastructure really go hand in hand, we need to make sure that the underground services are good before we start any repaving projects—let’s do it once and get it right, not pave a road then rip it up two years later to deal with sewer or water issues,” said Burke. “This is partially why the Planning and Sustainability Committee has been formed, to work with Village Engineers to start the process of updating our underground mapping data, updating infrastructure condition status and setting priorities for repair, refurbishment and replacement of underground and surface projects. A Planning and Sustainability Committee will work with Village Engineers to update the underground mapping data, update infrastructure condition status, and prioritizing repairs, refurbishment, and replacement. Council wants to ensure that those areas in most urgent need are addressed first because of the high cost of undertaking such projects. Over $92,000 will be set aside in reserves to fund the start of this important work. The cost for operating the water treatment plant and distribution system will be reduced by over $90,000 by hiring qualified in-house water treatment operators and one supervisory position overseeing our municipal public works program. $15,000 has been earmarked for sewer main repairs along Hankin Street. This was budgeted based upon 2012 camera work. Downtown Development: The new Village Office frontage makeover and long overdue roof repair allows the Village to lead by example to encourage sprucing up other store front facades while promoting potential new developments along Hankin street. Did you notice the new clock on the Village Office? It is a gift from the Lions Club and the Village thanks them for their commitment and dedication to Community betterment. Community Services: In partnership with the Community, we will see ongoing improvements to the ball field and the Lions Park Campground. Village staff will be tasked with cutting grass and the transfer station will be emptied weekly. Residents of Thorsby are allowed to use the Lions Park sewer transfer station for a $5 donation to the Lions Club to support future enhancements to the park. The Parks and Recreation and Fire Department cost sharing partnership with Leduc County will continue. The ice plant at Arctic Spas Rec Complex will continue to see upgrades through the summer with a new chiller unit and maintenance on the ageing mechanical system thanks to a partnership with TMHA and the $20,000 raised through Kraft Grant Program (and “hopefully, some Provincial dollars,” added Burke.) The Village continues to appreciate the corporate support from Arctic Spas with an annual sponsorship of $8,000 for the capital improvements to the recreation complex. The Village employs a part-part Family & Community Services and Support Professional and has an appointed Council Advisory Committee. In order to continue to provide programs and services through FCSS, the Village provides $22,500 over Provincial funding. Leduc County also supports our FCSS with funding management and sourcing of additional services, thereby providing valuable support to our residents when help is required. The Communities in Bloom/Village partnership continues with the Village investing $6,000 toward community enhancement and beautification projects. In 2012, CiB achieved 4 blooms out of 5 thanks to the hard work of community members. The RCMP will receive from the Village $5000 in funding for a part-time admin clerk to free-up Officers’ time so they can spend more time away from clerical details and more time in the field. Bylaw Enforcement Services will be continued through a contracted position. Council will be looking towards completing a Community Standards Bylaw in 2013. 2013 Volunteer Appreciation received funding from the Village to celebrate and acknowledge our energetic Volunteers at a dinner event featuring entertainment and prizes. Glen Taylor continues to lead the charge to provide an excellent system of trails, along with some amazing volunteers and Community Fit. Glen has secured yet another grant to keep the momentum going for this great work. Thank you, Glen! Additional Budget Information: The total operating budget has been reduced by $125,226.00. The Annual MSI Capital Funding will continue to offset our new state-of-the-art water treatment facility. Annual MSI Operating Funding will help offset infrastructure repairs and maintenance. There will be a Municipal Election this coming October, 2013. $5,000 has been added to allow for new Councillors to attend Alberta Urban Municipalities Association (AUMA) conference and training opportunities. There is no increase in Councillors’ honorariums in 2013, even with an increase of two added meetings per month, Committee of the Whole, and the Planning & Sustainability Committee. Council now attends four required Council meetings per month in addition to their individual committee commitments. The new water tanker for the Thorsby Fire Department will be debentured over 10 years. The cost is approximately $266,000. Leduc County is currently reviewing policy concerning non-county resident access to the Sunnybrook transfer station. There have been no final details yet; but it is expected that Thorsby residents will have to purchase single use cards from the Village Office for each trip. Under the current system, cards are loaned from the Village office. Unfortunately, they frequently are not being returned—excluding other Thorsby residents from accessing the station when they need it. A consultant has been hired to help the 39/20 Alliance formalize the structure through provincial funding. The Bottom Line:Your residential taxes: The average residential assessment has increased 5.6%. This is governed by the Municipal Government Act of the Province of Alberta. The estimated value placed on your property comes from the measurement, analysis and interpretation of the real estate market. 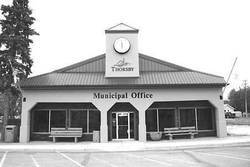 This means that based on your assessed property value, the average house in Thorsby would see an increase of approximately $54 per year in the municipal property tax. This is how the municipal portion of your residential property tax dollar is distributed: 27% for Public Works—water, sewer, and garbage; 22% for Parks and Recreation; 22% for Administration, Legal, Audit, Economic Development, and bad debts; 9% for Public Works-Common Services; 8% for Fire, Disaster Services, and Bylaw; 6% for Public Works-Transportation; 2% for Library Services ; 2% for Legislation; and 2% for Family & Community Support Services.